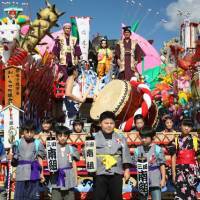 Marching orders: Children join last year's Oirase Shimoda Festival parade. The town of Oirase, Aomori Prefecture, seems like a good place for homesick Americans to settle down. It’s known for its own Statue of Liberty — bigger than the one that sits at the edge of Tokyo Bay. This weekend, the town will also host one of the northern region’s most popular attractions — the Oirase Shimoda Festival. 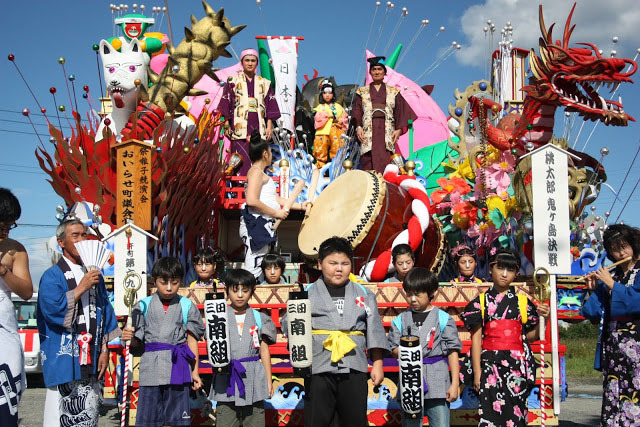 The annual three-day festival features parades of decorated floats that are similar to the ones used for celebrations in the United States, but this one will take you on a journey to ancient Japan. Oirase Shimoda is also different from other festivals that often feature marionettes or paper dolls, which can be seen at numerous celebrations across the country. Instead, it features performances by “living dolls.” These are the performers disguised as gods, monsters and other characters from mythology, or as historically famous samurai warriors. The festival has been held around the time of the main harvest in the region since 1952. It follows the Oirase Momoishi parade in neighboring Momoishi, which dates back to the Meiji Period (1868-1912). Although the two cities have been merged into a new town, Oirase, the two events remain distinct. Dancing and other performances will be held. Visitors can also join a karaoke contest, a live concert by a local singer and a lottery. Oirase Shimoda Festival takes place at the square in front of Shimoda Station in Oirase, Aomori Prefecture, from Sept. 27 to 29. For more information, call 0178-56-4703 or visit www.aptinet.jp/Detail_display_00000750.html.